Is it easy to get motivated this week? For most people, this is the final week of summer. Although the calendar says that fall begins late in September, most of us count the day after Labour Day as the first day of the new season. All the things we wanted to do this summer now must be crammed into these final five days. Are you motivated to enjoy these days or to cram them with activity? Does the coming change in pace and focus make you more motivated or less motivated? Do you notice a difference between being motivated and getting things done? The change of seasons always provides a great moment in which to catch ourselves dealing with transition. Some of us are frozen in the moment, waiting for a signal that change has already happened. Some of us are whirlwinds of activity, rushing between what has been and what is coming next. Some of us are steadily putting in place the conditions we need to take our next steps. What is the point of your work? The question is not always (or even usually) this blunt. It is what people are trying to find out. Not just "what do you do?" but "what difference does what you do make to you and to other people?" "All humans, by their nature," said Aristotle, "desire to know." A special and unparalleled way to know is to go where you've never been. And the key to this quest for knowledge is "elsewhere." In going there, you join. . . an "Elsewhere Community." It's a concept that is impossible to define strictly. It can name where you dream of going -- where bluebirds fly, perhaps. Or it can describe the people you've met somewhere, memories of whom have helped to change you. Or it's an awareness of your own growth and change. . ."
Knowing what you intend is powerful. Whatever else consciousness does, it is particularly effective at pointing the whole mind towards a particular outcome. You can't always get what you want - but if you try sometimes, you might find it's easier to like what you get when you think about what effects you intend to have on readers and on the world. I have to write an email about the meeting next week. I am going to send an email so that people remember to come to the meeting next week on time and fully prepared. Which writer do you think is more likely to get what she intends? The largest portion of your writing is probably largely routine writing. It's easy to give up forming an intention and go with the flow of writing 'about' whatever seems to be required. Don't do it. We're on our way to the beach this morning. We'll be on our way to a different beach this afternoon, and probably a third beach this evening. It's our final day on the island and we will be working on building a strong enough representation of an island beach that we will be able to call it up at will over the months it takes us to return to PEI. The key to the day is to breathe salt air, feel the sand under our bare feet and the waves as they splash at our ankles. To notice the blue of the sky and the green of the potato fields and the different green of the grass on the dunes. To hear the wind and the waves. To gentle ourselves into the rhythm of this place, without consciousness of holding on or of letting go. Writing is paradoxical: on the one hand, it can be the most public form of communication. Anything you write - particularly in your business life - can have a long shelf life and it can travel to unpredictable places. That's why we hear horror stories once or twice a year about email that went to the wrong people. It's why we have all heard stories of people who lost jobs over lies on their resumes that were uncovered years after the resume was created. What you write may or may not be true, but if it is true that you have written it, then you had better be able to commit to it. What gets you started in the morning? Persuading someone to read something - even something very short - requires a leverage point. You need to have something to exchange for the time and attention it will take to read what you have written. We often think we know what will motivate others until we take some time to reflect on what actually motivates us. WIFM? What's in it for me? That may be the question that you have assumed is at the heart of all motivation. It is - and it isn't. People have done astonishing things because what was in it for "them" was the ability to make a difference in other people's lives. This does not mean that we are all motivated by altruism: it does challenge the generalization that all motivation is self-centred. The blog posts have been slow in the last week because I was making my way to one of my favourite places on the planet: PEI. It's been four years since our last trip here, and the island is as restful and beautiful and thoroughly alive as it is in my memory. 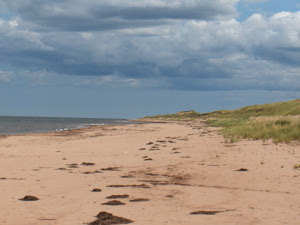 Yesterday, we walked Brackley Beach - a perfect combination of wild beauty and gentle curves and teens playing frisbee and families building sand castles. Miles and miles of beach, so that it is never crowded, even when the sun is warm and the water is almost warm! Written communication is a tough boss. It demands that you think about everything you want to say and identify exactly one message or unifying thread to run throughout a single piece of writing. No matter how complicated the work, how much interesting background you have, or how busy you are, good writing is always "about" just one thing. If you have several completely different things you need to address with a single correspondent, you have three choices: 1) pick one and avoid the others; 2) write several pieces of correspondence or 3) find a single thread that runs through all the different things and make that your central message. "Teachers can sometimes work in strange ways. They may never tell you anything directly about your work, or coach you, or give you explicit instruction. They may never offer a criciticsm or even a suggestion, but you are learning all the time. Almost everything I learned from my teachers came to me indirectly: I observed their art, thought hard about their dazzling skills and knowledge, and brought them many cups of tea; in other words, I was a devoted listener to those who knew far more about stories, storytelling and life than I did."